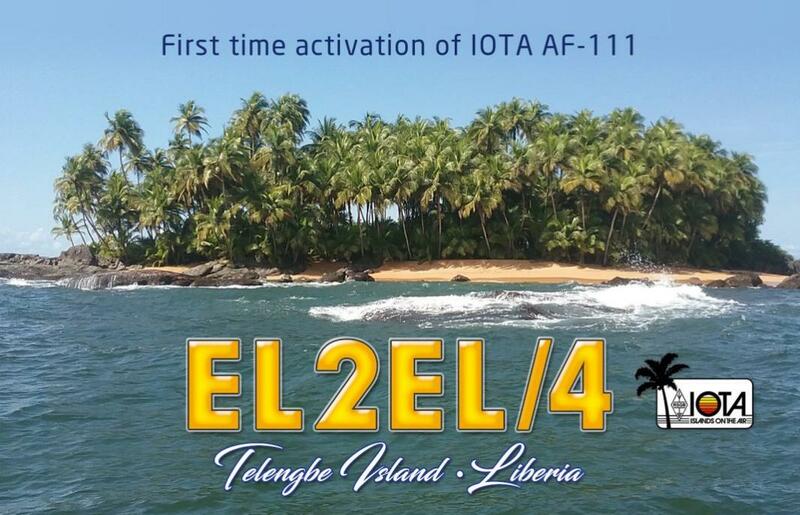 The activation of AF-111 as EL2EL/4 is approved/validated for IOTA credit. Flying over the coastline of Liberia last year – on the way to the ill-fated 5L3BI DXpedition – dotted below in the sea were numerous rocks, islets and islands. An immediate thought was that some of them likely qualify for the AF-111 IOTA group, along with the already established Flat and Baiyah islands. Using Bing Maps and historical charts from US Library of Congress it was evident that numerous islands shown corresponded with those named on archived charts. Thus, the idea to activate Telengbe Island was born. On August 23 & 24, 2018 Eric EL2EF went on a recce trip to the Sasstown region of Liberia. We wanted to find out exactly if local villagers knew of the islands mentioned on maps and if possible to visit & stay operating ham radio. The response was a positive – “YES” – they know (and visit) the islands and we can go there with our radios without issue! Eric EL2EF in centre with village chief to his right. Behind Eric is Telengbe Island. Telengbe (local name) is an island covered in coconut trees and has a small beach. Often villagers visit to harvest coconuts. It also has a fresh water well for drinking. Keeping in contact with IOTA HQ we patiently waited until it was officially confirmed that Telengbe Island qualifies for AF-111 group, along with Dead Islet and Monkey Island. Our journey to Telengbe soon begins.. Typically, activations of brand new IOTA groups are costly and as such donations are solicited to help offset expenses. However, we have decided to make this DXpedition a charity one – meaning every single donation (individually, group or via OQRS) will be used to help MAF Liberia continue to provide humanitarian flights. Please do consider a generous donation here – thank you. September 2, 2018 January 12, 2019 .